Note: While this review will be spoiler free, it will make reference to previous books in the series. 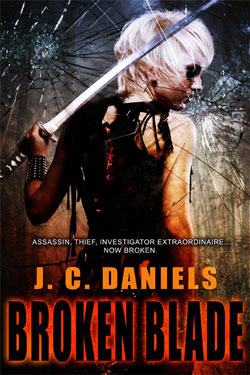 If you haven’t started yet, check out VBC’s review of book 1, Blade Song. The end of Night Blade was brutal, like emotional sucker punch brutal. It was going to be a tough journey back for Kit, and at the beginning of Broken Blade she isn’t even sure that journey is possible. After her rescue from the horrendous ordeal she suffered at the hands of Jude, Kit has retreated to her old sanctuary Wolf Haven. Tormented by nightmares, terrified she may never recover her Aneira abilities and deeply scarred both physically and emotionally, Kit cannot see a way back. Those around her however are determined to help Kit reclaim her life. When a terrified young girl needs help tracking down her cat shifter beau, they persuade Kit (reluctantly) to look into it. There are other clients hanging around though; ones with much more deadly agendas and who are willing to pounce as soon as Kit steps outside her safe haven. A ancient relic has been stolen and she has been charged with finding it. The closer she gets to it, the less certain she becomes that even her client can be trusted with it. Broken Blade is split into two parts, the first very much concentrating on Kit’s emotional state. Tired, scared and very angry, she feels like she is truly broken. Kit’s struggles to cope with all these feelings and in particular I really felt her devastation at the loss of her abilities, especially the weapon song. It was tough seeing her like this but she slowly begins to work through these feelings, using a supernatural therapy of sorts. Personally I think bravery comes from doing things even though you’re afraid, and to me Kit displayed true bravery here at times. As she starts interacting with the supernatural world again, she has to confront some of her emotions, be it fear with the vampires, or anger at the cat clan. None of this comes close to how hard she finds it to face Damon though. I really liked the dynamic between Kit and Damon here; I saw a different side to him in Broken Blade, a gentler side. No matter how hard Kit pushes him away, he’s there, asking for nothing and silently pledging himself to her side. The second half, entitled ReMade, sees the investigation into the ancient relic kicked up a notch, with much of the action occurring in this half. The mystery is a really interesting twist on an old, well-known legend, lending itself very well to an origins story of this supernatural world. As always, anything to do with the Aneira fascinated me, I just wish there had been even more details. I really hope some more Aniera characters are introduced soon. There were quite a few surprises concerning established characters that I didn’t see coming as well. I felt a whole range of emotions while reading Broken Blade. Kit goes a long way to understanding just how much strength she has inside, particularly in the absence of powers she once thought defined her. I feel like I’ve learned so much about her character that I’m definitely in for the long haul on this series.